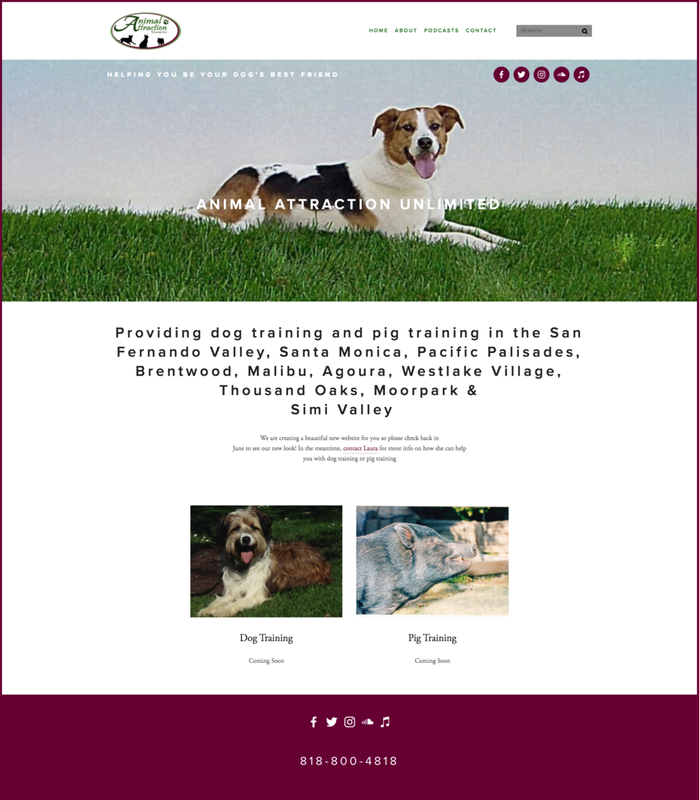 Animal Attraction Unlimited is a positive reinforcement-based dog AND pig training business in the Los Angeles area owned by Laura Bourhenne. Laura is a smart, proactive business owner who wanted to update her website that was previously built on Hubspot. She had already started the process by purchasing a new site on Squarespace, but wanted to make it look and function at its highest potential. Laura's website is actually a really good example of the benefit of working with a professional to re-design your website rather than trying to do it on your own. Even though she also used Squarespace on her own for her temporary site, the re-design process showed how much more you can get using the same builder and content when working with Choose Positive. It was exciting for me to be able to work on designing a website for not only dog training, but also pig training! I learned the difference between a potbelly pig, farm pig, and kune kune pig as we were choosing the best pictures for the site. Below are the before and after versions of the site. In general, the site looks much more clean and put-together, with more aesthetically pleasing images, fonts, and formatting. We started by choosing a new template that would not only show off Laura's services, but also her podcast, "Doggie Dish Radio." After deciding on the best template and fonts for the site, Laura was open to updating her old logo to match the new style and feel of the new site, while still keeping some of her favorite parts of the old logo. Laura purchased some stock photos on her own that I could then choose from to create a warmer inviting feeling to users visiting her site. We also paid close attention to incorporating specific and targeted locations and wording of her services throughout her site on the front and back-ends to make sure SEO was prioritized. See the video above for more details, or visit the new LIVE Animal Attraction Unlimited site!